Good morning Nosh show listeners! Episode 44 is upon us and we finally dive back in to another Happy Happy Mystery Package Fun Time courtesy of Junk Food Guy, and guess what, he's got a surprise in store for us since it seems so long since the last HHMPFT. There's not 1, not 2, not 3, but *4* surprises in this package.... and one of them makes a pretty fun looking sundae. Wondering what those crazy looking cookies are? Well let's find out! 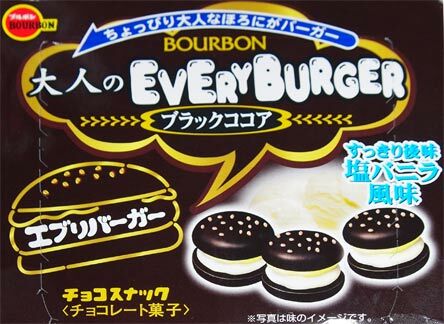 They are from a company called Bourbon in Japan and this is their "Everyburger". Looking at tumblr, there's an everyburger that looks like a regular hamburger as well, so I'm guessing this might be like the blackened sesame version or something. Notice there is a picture of vanilla ice cream behind the cookies (really wish one of us could read Japanese right now). It's so funny to see them pretty much match the picture on the box. 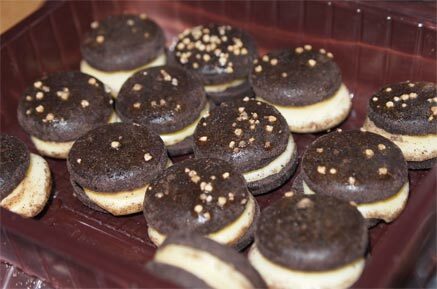 They are about the size of those bite-size york peppermint patties and they aren't bad at all. It's funny they call it everyburger because there is almost a cheeziness to the filling. You know how a nabisco famous wafer kind of tastes like an Oreo wafer, but the texture is a bit more solid? Well, these are to famous wafers what famous wafers are to Oreo wafers. It's not really a texture we see a lot on U.S. shelves, but it's not bad, it's just different. 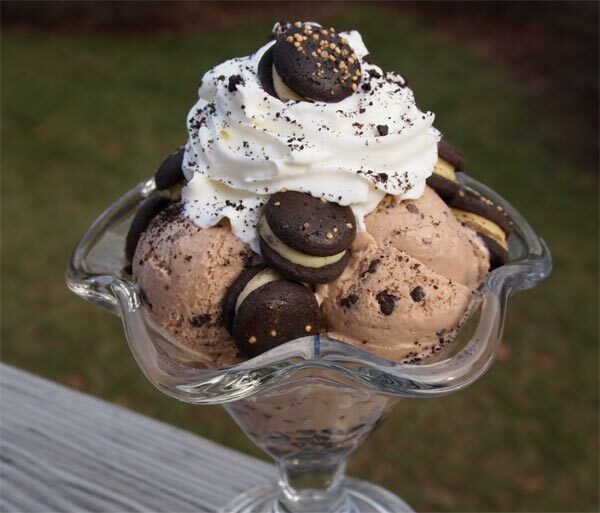 Oh, and they tasted pretty good in the sundae, though they are a little on the big side for a mix-in. In the future I should probably chop them in half first. Now these were the best and the worst mysteries in the package. 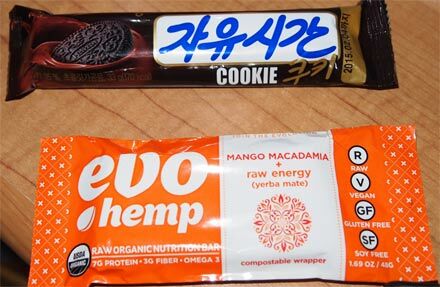 I would totally buy the one on the top again (if I can find them) and I'm still trying to forget the one on the bottom. Be sure to listen to the show to find out exactly what I mean, it made for some pretty entertaining podcasting.